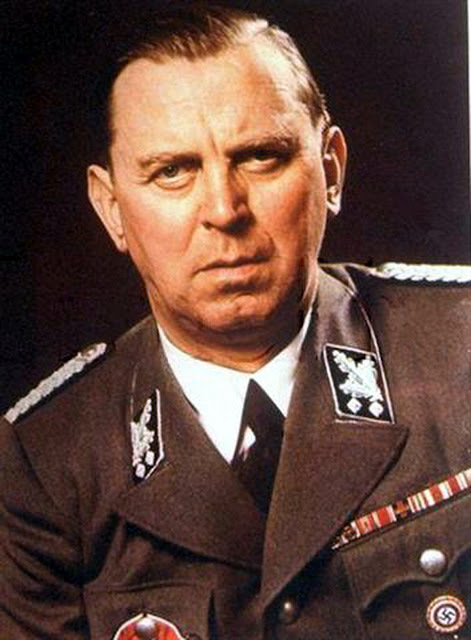 SS-Obergruppenführer Julius Schaub was born in Munich, Germany, on 20th August, 1898. He then joined the National Socialist German Workers Party (NSDAP) in the early 1920s. In April 1923 NSDAP headquarters received a letter accusing his wife of prostitution and procuring. The marriage was dissolved two years later. According to Traudl Junge: "Both Schaub's feet had been injured in the First World War, leaving him crippled. Later he had joined the NSDAP; and Hitler noticed him as an ardent admirer who always attended Party meetings, hobbling in on his crutches wherever Hitler appeared. When Hitler discovered that Schaub had lost his job because of his Party membership he took him on as a valet." In November, 1923, Schaub took part in the Münich Putsch. He was arrested and served time in Landsberg Castle. During this time he became close to Adolf Hitler. On his release he worked for Hitler as his personal assistant. He joined the inner-circle that included Heinrich Hoffmann, Max Amann, Emil Maurice, Wilhelm Brückner and Hermann Kriebel. Schaub described himself as "Hitler's shadow, his daily companion, his constant retainer... perhaps the only person who could, outspokenly but with impunity, tell him anything that came into his head... In addition to the qualities required of a personal aide - notably, discretion, reliability and circumspection." It has been argued by Lothar Machtan, the author of The Hidden Hitler (2001): "Julius Schaub... organized Hitler's private life from early 1925... He accompanied him on his travels, handled his finances and ran his household. He welcomed guests, got rid of unwelcome visitors and thus controlled access to Hitler. Of all the men in his immediate circle, it was Schaub who had the most detailed information about all of Hitler's intimate and personal affairs." In 1931 Schaub married for a second time. Hitler was a witness and made his home available for the wedding reception. One of his weaknesses was drink. At parties he always "behaved atrociously", but when this was reported to Hitler, the Nazi leader merely made 'a despairing gesture' and sighed: "yes, I know, it's sad, but what can I do? He's the only aide I've got." Despite this, Schaub and Hitler always remained close. Ian Kershaw has pointed out in the book 'Hitler 1889-1936' (1998) that after Adolf Hitler took power in 1933, his inner-circle became even more important: "Hitler had taken his long-standing Bavarian entourage into the Reich Chancellery with him. His adjutants and chauffeurs, Bruckner, Schaub, Schreck (successor to Emil Maurice, sacked in 1931 as chauffeur after his flirtation with Geli Raubal), and his court photographer Heinrich Hoffmann were omnipresent, often hindering contact, frequently interfering in a conversation with some form of distraction, invariably listening, later backing Hitler's own impressions and prejudices." Christa Schroeder was Hitler's personal secretary and had a lot of contact with Schaub. She wrote in her autobiography, 'He Was My Chief: The Memoirs of Adolf Hitler's Secretary' (1985): "He (Julius Schaub) had rather staring eyes, and because some of his toes had been frozen in the First World War, he sometimes walked with a hobbling gait. It may have been this disability that made him so cantankerous. Always suspicious, and full of curiosity into the bargain, and inclined to give a wide berth to everything that wasn't congenial to him, his popularity in Hitler's circle was limited." Another secretary, Traudl Junge, commented: "His devotion, reliability and loyalty made him indispensable. He slowly worked his way up to adjutant and finally to chief adjutant, because he was the only one of the old guard who had been through the early years of the struggle himself, and he shared many experiences in common with Hitler. He knew so many of the Führer's personal secrets that Hitler just couldn't make up his mind to do without him." Lothar Machtan, the author of The Hidden Hitler (2001), has pointed out that Schaub stayed with Hitler until he committed suicide: "The finest proof that he really could count on their loyalty was supplied at the end of April 1945, once again by Julius Schaub, who left the flaming ruins of Berlin at the last possible moment and set off for Bavaria, where he emptied the safes in Hitler's Munich apartment and on the Obersalzberg and burned their contents. What these documents were, Schaub doggedly refused to divulge until the day he died. All he once volunteered, in a mysterious tone of voice, was that their disclosure would have had 'disastrous repercussions.' Probably on himself, but most of all, beyond doubt, on Hitler." Schaub, possessing false ID papers with the name "Josef Huber", was arrested on 8th May, 1945 in Kitzbuehl by American troops. The authorities could not find any evidence that he had participated in war crimes and he was released on 17th February, 1949. Julius Schaub died in Münich on 27th December, 1967.